Metro station: Malostranska (line A), then take tram 22 to Prazsky hrad or Pohorelec. Prazsky hrad offers the shortest route to Prague Castle. Pohorelec enables you to take a short walk through the Castle District (Hradcany),which is quite pleasant, before entering Prague Castle by the main entrance. St. George's Basilica (Bazilika Sv. Jiří) is the oldest church building within the Prague Castle complex. It is also the best preserved Romanesque church in Prague. 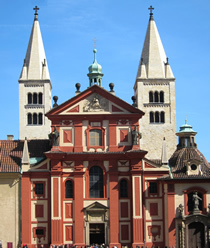 St. George's Basilica was founded by Prince Vratislav (915-921) in 920. The basilica was then enlarged in 973 with the construction of St. George's Benedictine Convent. In 1142 St. George's Basilica had to be rebuilt following a fire. And the Baroque facade that we see today was added in 1671-1691. Its ceiling is made of a deep, dark wood, its height accentuated by the fairly narrow width of the church. Decorative windows in the stone walls provide atmospheric lighting. The overall effect is very old world. The altar painting and frescos in the dome are the work of V.V. Reiner. Within the church lie several tombs of major historic importance. In the Gothic Chapel of St. Ludmila lies the tomb of St. Ludmila, the saint and widow of the 9th century ruler Prince Borivoj. Also buried in the basilica are Prince Vratislav and Boleslav II. To enter St. George's Basilica visitors need to purchase a Prague Castle Tour or a Prague Castle Self-Guided Ticket. Another way to visit is to attend one of the early evening classical music concerts. The church's high ceiling and Romanesque architecture, coupled with its romantic setting within Prague Castle, provide a wonderful setting. During the winter the interior of the church is heated, but it is advisable to wear warm clothing for the concerts. For listings and to book tickets for classical concerts at St. George's Basilica: Prague concerts.